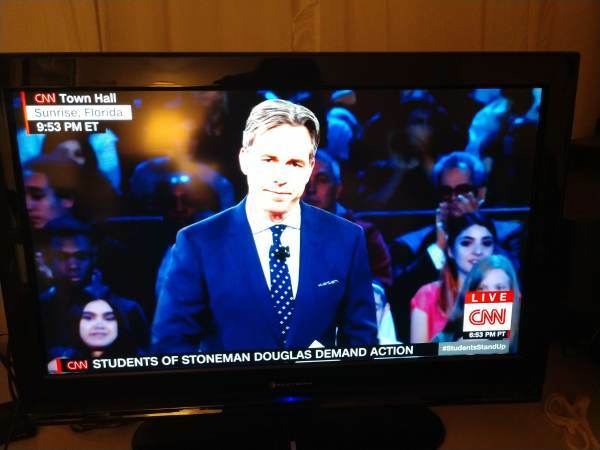 CNN’s Jake Tapper, host of the town hall held Wednesday night in Sunrise, Florida on the February 14 Parkland school massacre worked in 1997 as a spokesman for Handgun Control, Inc., the precursor to the Brady Center to Prevent Gun Violence. CNN and Tapper have failed to disclose Tapper’s anti-gun activism in advance of the town hall. Anti-gun activist Jake Tapper hosting gun control debate Feb. 21, 2018, screen image. Tapper was quoted by the Chicago Tribune on September 12, 1997, attacking then NRA first vice president Charlton Heston. …Heston decreed that the Constitution’s 2nd Amendment — which refers to the “right of the people to keep and bear arms”–was the “most vital” of all the amendments and was “more essential” than the 1st Amendment, which guarantees freedom of religion and of the press, among other freedoms. “It is America’s first freedom, the one that protects all the others,” Heston said of the 2nd Amendment in a speech at the National Press Club. Heston, who is 72 and first vice president of the NRA, spoke to an audience of mostly journalists. Gun-control organizations labeled the speech as that of an extremist and said it would hurt the gun lobby’s cause. The New York Times quoted Tapper on November 6, 1997 attacking the NRA after a gun control initiative failed in Washington State. Gun-control advocates readily acknowledged that they had been outspent by the N.R.A., saying that was almost always the case in an initiative fight. But they were far from ready to write off their new legislative strategy. ”We always get outspent by the N.R.A. because there just isn’t any money to be made by passing gun controls,” said Jake Tapper, a spokesman for Handgun Control Inc., the nation’s leading advocate of tougher firearms laws. A news search shows no results from articles about Wednesday’s CNN town hall that mention Tapper’s background as an anti-gun extremist. Tapper’s bio page at CNN makes no mention of his work with Handgun Control, Inc.
CNN’s announcement of the town hall on Monday did not mention Tapper’s work with Handgun Control, Inc. When CNN announced earlier Wednesday that the NRA would participate in the town hall, it made no mention of Tapper being a past anti-NRA activist. Judging from reports on the town hall, Tapper himself did not mention his past with Handgun Control, Inc. when he introduced the town hall.